Arbor Ridge Pet Clinic Utilizes Ultra Safe Anesthetics Like SevoFlurane! Your pet's safety is in good hands when you trust Arbor Ridge Pet Clinic with their surgical and anesthesia needs. Your pets are well cared for with an IV (Intravenous) catheter, thermal support (IV warmer, warmed fluids, warm circulating water blankets, and warm forced air blankets), as well as state of the art monitoring equipment in the capable hands of our well trained certified technicians. But best of all, our staff is utilizing ultra-safe anesthetics to make your pet's anesthetic procedure as low risk as possible. The Arbor Ridge Pet Clinic utilizes the state of the art gas anesthetic, Sevoflurane for all of its gas anesthetic procedures. While your pet is under anesthesia an intra-tracheal tube is placed in its trachea, this tube delivers oxygen and gas anesthesia to keep your pet asleep for the procedure being performed. 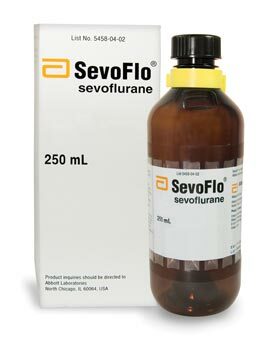 Sevoflurane is the main gas anesthetic used on humans today. It is a very safe anesthetic, 98% of it is breathed out of the lungs unchanged and thus does not rely on the liver to break it down and get rid of it. It passes from the air to the blood stream quickly which allows for quick induction, quick and smooth recovery from anesthesia, as well as the safety to be able to adjust or fine tune your pet's anesthetic plane as the need arises. 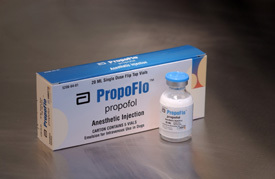 Even though this anesthetic is a more expensive anesthetic than the old Isoflurane or Halothane, we believed it was in the best interest of our patients to use Sevoflurane. We are one of a very few clinics in the Madison area that utilizes this ultra-safe anesthetic. 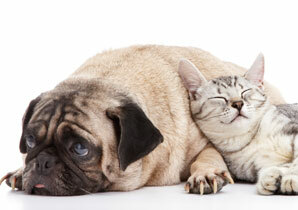 For anesthetic induction the Arbor Ridge Pet Clinic utilizes Propoflo on most of it patients. Induction drugs are used to induce anesthesia, then the pet is intubated and placed on oxygen and Sevoflurane for the remainder of the anesthetic procedure. Our clinic utilizes Propoflo for many reasons. Number one being the safety of the medication. This medication is broken down by the subcutaneous area of the body (the tissue that is under your skin). What this means is that once again the drug does not rely on its major organs like the liver or kidney to break down this drug. This means that this drug can be used with less risk on our organ compromised patients. This drug is also broken down in the patients body in 7-10 minutes which makes it quick to leave the body. As you can see above the Arbor Ridge Pet Clinic does everything it can to provide your pet with the safest surgery and anesthetic procedures it can. Please call today if you have any questions about any thing you have read on our web site.